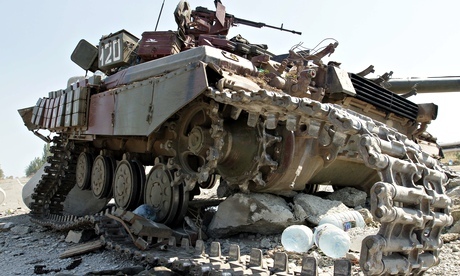 Destroyed Ukrainian military hardware is strewn across the outskirts of Mariupol, reports the Guardian. September 9, 2014 -- A version of this article was first published at Truthout, posted at Links International Journal of Socialist Renewal with the author's permission -- A ceasefire in the war in eastern Ukraine was announced in Minsk, Belarus on September 5. Ukraine President Petro Poroshenko made a simultaneous announcement in Wales, where he was a special guest at the summit meeting of the NATO military alliance. A 12-point agreement was signed in Minsk by representatives of the Kyiv government and the Peoples Republics of Donetsk and Luhansk. Also signing were former Ukraine president Leonid Kuchma, Russian ambassador to Ukraine Mikhail Zurabov and Heidi Tagliavini of the Organization for Security and Co-operation in Europe. The text of the agreement has been published in Russian, here. An unofficial translation to English is here. Terms include a cessation of military hostilities, exchanges of prisoners of war and release of people illegally detained, humanitarian aid and reconstruction assistance, and most importantly, recognition of political autonomy for the Donetsk and Luhansk regions in the south-east of the country. The autonomy provision presumably obliges the withdrawal of Ukrainian military and far-right paramilitary forces from south-east Ukraine. But it’s not clear if that will happen, including from the important cities of Mariupol and Slavyansk. The ceasefire and the political autonomy that is recognised are considerable political achievements for the rebellion in south-east Ukraine. For the past four and a half months, the people of the region have resisted a brutal, military offensive launched by the governing regime in the capital Kyiv [or Kiev]. Only a few weeks ago, the military offensive was threatening to encircle the large cities of the region and crush self-defence forces. On August 27, rebels launched a counter-attack along the Black Sea coast and at several locations inland, delivering what eyewitnesses are calling a “catastrophic” defeat of Kyiv forces. Both sides in the conflict are militarily exhausted, meaning prospects for the ceasefire holding in the short term are good. But there are many reasons to doubt that it will hold over the longer term. The main reason is that the Kyiv side and its international backers are expressing little support for it. NATO says it will proceed with more sanctions on Russia, showing no sign of relenting in its propaganda war claiming that Russia has “invaded” Ukraine. An aide to President Poroshenko, Yuri Lytsenko, says that five NATO countries—the US, France, Italy, Poland and Norway—will provide advanced arms to Ukraine. According to Associated Press, NATO’s response to that inconvenient news leak is to say that while the alliance itself will not send weapons to Ukraine, “individual allies may choose to do so”. On the other side, what is the reaction of the people of southeast Ukraine to the news? Many will be thankful if the bombardments from Kyiv stop. But they have endured five months of shelling, occupation and carnage brought upon them by Kyiv and it’s difficult for them to see any future in such a country. At least three leaders of the self-defence forces—Paul Gubarev, Igor Strelkov and Alexey Mozgovoi—have expressed scepticism about the agreement. All this means that patience with the inevitable provocations and violations of the ceasefire by Kyiv and its fascist allies will be very thin. It’s doubtful that many of the 1 million or more people made refugees by the war will return home amid ongoing uncertainty, including the fact that the economic interests driving the war are still hell-bent on their course. Judah writes of seeing lengthy columns of tanks and other armoured vehicles utterly destroyed as they sought to retreat from advanced positions where they risked being surrounded. The rebel victory and the ceasefire it prompted have come at an exceptionally high human cost on both sides. Exact casualty figures of Ukraine’s army and militias are kept secret. Kyiv’s figures speak of nearly 1000 military deaths and thousands of injuries since it launched its “anti-terrorist operation” in late April. But unofficial casualty figures are in the tens of thousands. The war crimes committed by Kyiv have taken an enormous toll on civilians. Unable to capture large cities, the regime instead rained artillery on them over several months. Thousands of residents have died or suffered injuries. Many thousands of homes and apartments have been damaged or destroyed, as have factories and coal mines. Life support systems such as water, electricity, communication and medical services have been heavily damaged or destroyed. Among the targets of shelling have been schools and hospitals. Shelling of Donetsk on September 4, 2014. The cities of Donetsk and Luhansk have seen about half of their populations of 1.1 million and 450,000, respectively, flee for safety. The latest figures on refugees by the UN Refugee Agency place the number of war refugees inside Ukraine at more than 260,000—double the number of one month earlier. The agency cites Russian government figures that more than 816,000 Ukrainians have fled to that country this year. The cost of reconstructing all that has been destroyed is in the billions of dollars. The war is an effort to crush resistance to the neo-conservative government that came to power in Kyiv late February 2014. The new regime embarked on an abrupt, about turn for the country, announcing it would sign an austerity, economic agreement with Europe and thereby throw the country’s industrial and agricultural production open to the vagaries of the international capitalist market. Another condition of any agreement with Europe (and the US) is deep cuts to social spending, which the government began to make months ago. Industry in the east is heavily dependent on trade with Russia and especially vulnerable to “free trade” competition from Western Europe. This explains why anti-austerity rebellion took deeper hold there, compared to the more agricultural western Ukraine. The agreement with Europe was signed in June. The austerity and related war drive is accompanied by harsh crackdowns on democratic rights. These include bans on media and internet expression, bans on political parties, notably the Communist Party of Ukraine, and a measure that gives police the right to shoot on sight anyone deemed to be a “separatist”. Anti-war or anti-conscription protests by families and friends of conscripted soldiers have been on the rise ever since Kyiv imposed a third round of military conscription in July. A remarkable video interview with a Ukrainian soldier recently captured by self-defense forces describes the harsh conditions of service of conscript soldiers and the increasing disaffection with a war neither they nor their family and friends want. Anger and bitterness by protesters and soldiers at having their worst fears about the war realised are going to reap a terrible whirlwind of recrimination against the government and other supporters of the war in the weeks and months ahead. Even with substantial international assistance, Ukraine is going to owe a lot of money to a lot of different people and it isn’t going to have the means necessary to pay this money back. It’s also worth taking a second to remember that the “reforms” demanded by the IMF primarily amount to harsh austerity measures (primarily cuts in gas subsidies) that are massively unpopular among Ukrainians and that will have a hugely negative impact on the population’s living standard, which isn’t very high to begin with. There’s a reason that Yanukovych and every other post-Soviet Ukrainian leader has obstinately refused to implement these reforms (Ukrainians hate them!) and it doesn’t take a particularly active imagination to devise a scenario in which the reforms backfire and ultimately cause the onset of yet another political crisis. The government faces an acute challenge in preparing the country for winter. Its reckless confrontation with Russia has compromised the natural gas supply Ukraine was receiving from there, at cut-rate prices, no less. And its war has severely damaged coal production. Several months ago, the provisioning of hot water in many cities of western Ukraine was cut in an effort to conserve fuel stocks for winter. Prior to the ceasefire, many of the vital forces of the rebellion said their aim was the creation of a new state. They call it Novorossia [New Russia], an historic term for the lands on the Black Sea coastline stretching from the present day Russian border westward to the city of Odessa (not including Crimea). But the prospects for realising that project are daunting. There is the military firepower of Kyiv to contend with, including its powerful, foreign backers. Political opinion among the varying populations of the region is not universal–only in Donetsk and Luhansk is there likely a majority support for secession. Even there, discontent with the political rule of the rebels has been considerable. And contrary to the claims of Kyiv and NATO propagandists, Russia has never supported any version of a sovereign state in eastern and southern Ukraine. President Vladimir Putin expressly stated just weeks ago that a political settlement in south-east Ukraine should preserve the unitary state of Ukraine. An entirely new element may come into the political picture as a result of Kyiv’s military defeat—a rise of opposition in western Ukraine to the austerity policies and ascendance of extreme, right-wing nationalism that propelled the war. Prospects for socially progressive alliances across the east-west divide would make a secession option less desirable or inevitable to the population in the east. The dramatic change in the military balance created by the rebel offensive raises important questions about Russia’s exact role and designs. Contrary, again, to the Kyiv and NATO propagandists, there is next to no evidence that the Russian army personnel played a direct role in the decisive rebel offensive. Rather, as openly acknowledged by rebel forces, rebel fighters received intense training during the past several months and there has been a significant influx of volunteer fighters from Russia. Heavy weaponry obtained by rebels reportedly played a key role in the counter-attack, as did military protection of the border (thus facilitating the movement of rebels). Border protection is the source of NATO’s sharpest condemnation of Russia --.it wants Russia to police and curb the autonomy movement, something akin to how Egypt collaborates with Israel and the US in restricting the movement of people and goods to and from the Palestinian territory of Gaza. But Russia’s rulers have nothing to gain and much to lose in bowing to imperialism’s diktats. The Russian public strongly supports the rebel movement and expects their government to defend it. Kyiv and NATO have repeatedly rejected Russia’s modest proposals to end the conflict, leaving no doubt that their goal is to crush the revolt. Such an outcome would leave Russia with even less leverage to prevent Ukraine from joining NATO. For Russia, Ukraine in NATO would be nothing short of catastrophic. Military aid to the resistance could forestall such an outcome. The US and Britain, in particular, left Russia with little to lose from a shift to increased support to the rebels. Regardless of the restraint that Putin and foreign minister Sergei Lavrov voiced to rebel fighters, regardless of their statements that Russia had no territorial designs on south-east Ukraine and wanted the war settled, the Western press still demonised Russia and Western governments continued to ramp up sanctions. So Russia had little to lose from doing something that it was accused of doing anyway—covertly assisting rebel fighters to avert a harsh defeat. An important consideration for Russia over what to do was the extreme vulnerability of Kyiv’s war effort. In July and August, Kyiv waged a relentless drive to cripple or destroy the rebellious south-east. Some territorial gains were made, but the large cities of Donetsk, Luhansk and Horlivka could not be taken. The army and its allied militias were poorly led and provisioned, and morale was sinking. By the middle of August, they were badly extended and highly vulnerable to counterattack. Simultaneously, the economic situation in the country is rapidly deteriorating. A rebel counteroffensive could show the impossibility of a Ukrainian victory while encouraging domestic resistance to the anti-Russia, war course. The fact that the ceasefire was signed before cities such as Mariupol and Slavyansk were retaken by rebel forces suggests the Russian government’s approach is to tip the military balance just enough that neither side achieves a decisive victory. The ceasefire agreement leaves a great many uncertainties over the future. But much has been learned throughout the region over the past six months and prospects are good for new forms of struggle for social justice and national self-determination to take hold across the east-west divide. Russia’s cautious role in events, including pressuring for an inconclusive ceasefire, will have many in eastern Ukraine casting a much more critical eye over its role and interests. Above all, the hawkish threats of NATO and the global capitalist interests it represents are a powerful catalyst for all the peoples of eastern Europe and Russia to unite against the twin policies of austerity and war. That will be a positive outcome to an otherwise tragic, five months of war. A movement of international solidarity with Ukraine can play a key role in blocking a return to war and facilitating popular reconciliation and anti-fascist, social justice struggle.